Black Cumin (Nigella sativa) appropriately known as the “seed of blessing” is one of the most documented healing herbs in recorded history. It appears in a broad range of ancient healing texts ranging from Ayurveda to Chinese herbalism and ancient Egyptian and Greek writings. An annual herbaceous plant, black cumin is believed to be indigenous to the Mediterranean region but has been cultivated into other parts of the world including Saudi Arabia, northern Africa and parts of Asia. 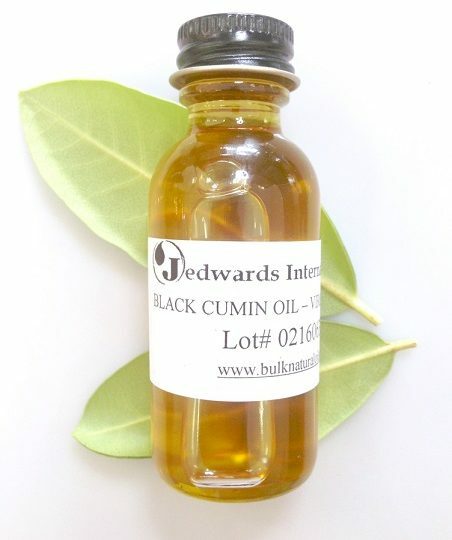 Jedwards’ bulk Virgin Black Cumin Seed Oil—available at wholesale prices in both conventional and organic virgin options—is cold pressed (temperatures don’t exceed 40 degrees C), so as to preserve the integrity of the oil. While many people appreciate its value as a nutritional supplement, and a delicious flavoring to foods, there are those who take a page from Cleopatra’s beauty regimen and add a few drops to their face cream and moisturizers. It’s another versatile oil from our ancient history sages!